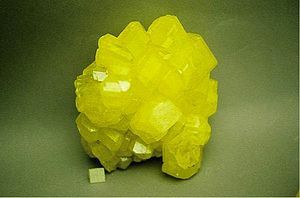 Sulfur is a nonmetal used mainly in fertilizer. It is also used in matches, gunpowder, and insecticides. Domestic Production and Use: In 2010, elemental sulfur and byproduct sulfuric acid were produced at 114 operations in 29 States and the U.S. Virgin Islands. Total shipments were valued at about $390 million. Elemental sulfur production was 9.1 million tons; Louisiana and Texas accounted for about 45% of domestic production. Elemental sulfur was recovered, in descending order of tonnage, at petroleum refineries, natural-gas-processing plants, and coking plants by 40 companies at 107 plants in 26 States and the U.S. Virgin Islands. Byproduct sulfuric acid, representing about 8% of production of sulfur in all forms, was recovered at seven nonferrous smelters in five States by six companies. Domestic elemental sulfur provided 66% of domestic consumption, and byproduct acid accounted for about 6%. The remaining 28% of sulfur consumed was provided by imported sulfur and sulfuric acid. About 91% of sulfur consumed was in the form of sulfuric acid. Agricultural chemicals (primarily fertilizers) composed about 60% of identified sulfur demand; petroleum refining, 24%; and metal mining, 4%. Other uses, accounting for 12% of demand, were widespread because a multitude of industrial products required sulfur in one form or another during some stage of their manufacture. Recycling: Typically, between 2.5 million and 5 million tons of spent sulfuric acid is reclaimed from petroleum refining and chemical processes during any given year. Import Sources (2006–09): Elemental: Canada, 74%; Mexico, 13%; Venezuela, 12%; and other, 1%. Sulfuric acid: Canada, 65%; India, 18%; Mexico, 7%; and other, 10%. Total sulfur imports: Canada, 72%; Mexico, 12%; Venezuela, 9%; and other, 7%. Events, Trends, and Issues: Total U.S. sulfur production and shipments increased slightly compared with those of 2009. Domestic production of elemental sulfur from petroleum refineries and recovery from natural gas operations increased. Domestically, refinery sulfur production is expected to continue to increase, sulfur from natural gas processing is expected to decline over time, and byproduct sulfuric acid is expected to remain relatively stable, unless one or more of the remaining nonferrous smelters close. World sulfur production increased slightly and is likely to steadily increase for the foreseeable future. Significantly increased production is expected from sulfur recovery at liquefied natural gas operations in the Middle East and expanded oil sands operations in Canada, unless the downturn in the world economy limits investments in those areas. The contract sulfur prices in Tampa, FL, began 2010 at around $30 per ton. The price increased to about $130 per ton in May and remained at that level throughout July. By November, the Tampa price increased to about $150 per ton. Export prices were slightly higher than domestic prices. Domestic phosphate rock consumption was higher in 2010 than in 2009, which resulted in increased demand for sulfur to process the phosphate rock into phosphate fertilizers. World Production and Reserves: Reserves of sulfur in crude oil, natural gas, and sulfide ores are large. Because most sulfur production is a result of the processing of fossil fuels, supplies should be adequate for the foreseeable future. Because petroleum and sulfide ores can be processed long distances from where they are produced, sulfur production may not be in the country for which the reserves were attributed. For instance, sulfur from Saudi Arabian oil may be recovered at refineries in the United States. World Resources: Resources of elemental sulfur in evaporite and volcanic deposits and sulfur associated with natural gas, petroleum, tar sands, and metal sulfides amount to about 5 billion tons. The sulfur in gypsum and anhydrite is almost limitless, and some 600 billion tons of sulfur is contained in coal, oil shale, and shale rich in organic matter, but low-cost methods have not been developed to recover sulfur from these sources. The domestic sulfur resource is about one-fifth of the world total. Substitutes: Substitutes for sulfur at present or anticipated price levels are not satisfactory; some acids, in certain applications, may be substituted for sulfuric acid. K-Mag - http://www.kmag.com/ - This division of Mosaic Co. (NYSE: MOS) makes potassium magnesium sulfate fertilizers which are an excellent source of sulfur, magnesium, and potassium.